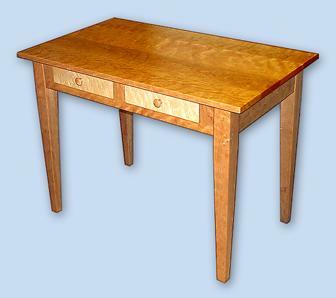 This solid cherry Shaker side table with clean functional lines has straight tapered legs and bird's eye maple dovetail drawers. It measures 40" W. x 24" D. x 30" H. shaker-side-table. This piece also functions as an extension for our matching 7 foot dining room table, as shown below, extending it to 9 feet or 11 feet if two are used. A matching buffet or server and china cabinet are avaliable. All pieces are constructed of 100% solid wood, available in curly maple, flame birch, oak, pine or any hardwood. Each piece is all handcrafted, dimensions, color may be altered to suit.